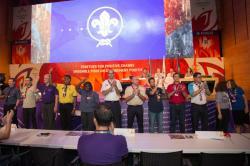 The 41st World Scout Conference continues its work in Baku, while several important decisions were made on August 17. The fourth day of the Conference saw the election 12 new members of the World Scout Committee for term 2017-2020. One of the elected new World Scout Committee members is Ilyas Ismayilli, the Chief Commissioner of the Azerbaijan Association Scout, who is now the host committee for this once in a three years conference. The complete list of the new 12 World Scout Committee members is as following: Mehdi Ben Khelil (Tunisia), Peter Blatch (Australia), Edward Andrew “Andy” Chapman (United States of America), Jo Deman (Belgium), Janaprith Salinda Fernando (Sri Lanka), Ilyas Ismayilli (Azerbaijan), Sarah Rita Kattan (Lebanon), Leonardo Morales Morales (Costa Rica), Pia Melin Mortensen (Denmark), Jemima Nartemle Nartey (Ghana), Juan Reig (Spain), and Craig Turpie (United Kingdom). 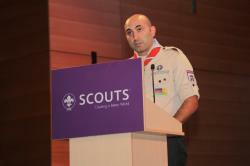 The conference also accepted Iraq Scouts to return to the WOSM with its status as a full member. This is one more add to the membership of WOSM, after the conference accepted Macau as the full member of WOSM on August 16. Today there also some interesting topic be presented. One of them is presentation of KAIICD, the international dialogue center who already helped WOSM on the dialogue for peace training, as part of the Messengers of Peace program. The presentation given by His Excellency Mr. Faisal bin Muaammar, the Secretary General of KAIICD. Then later in the evening there will be an ATAS gathering meeting. The Association of Top Achiever Scouts or also known as ATAS, is a group of all Scouts who already achieved its highest rank in each country. Such as Eagle Scout, King Scout, Queen Scout. Pramuka Garuda, Pengakap Raja, President Scout, Fuji Scout, Tiger Scout, and many other. The World Scout Committee is the executive body of the WOSM. It is one of three primary components of World Organization of Scout Movement (WOSM), with the other two being the World Scout Conference and the World Scout Bureau. The World Scout Committee is responsible for the implementation of the resolutions of the World Scout Conference and for acting on its behalf between its meetings.